A round of applause for the Beehive State: Two new light rail lines are officially opening this weekend in the Salt Lake City area, with the Utah Transit Authority saying it’s the first time any region has opened two lines at the same time. The UTA is also saying that both projects were delivered early and about 20 percent under budget. The Mid-Jordan line is 10.6 miles long and cost $535 million. The West Valley City extension is 5.1 miles long and cost $370. Taken together, the two lines cost about $57.6 million per mile — which is a very good price compared to most new light rail lines in the nation. Most Metro light rail lines cost much more due to tunnels and bridges needed in a denser urban environment. But the Gold Line Foothill Extension has a similar low cost: the two construction contracts to build the 11.5-mile line from Pasadena to the Azusa/Glendora border total about $505 million and the total cost is projected to be $735 million, a price that includes a large maintenance yard in Monrovia and new light rail vehicles. Here’s a story in the Salt Lake City Tribune about the new lines there. The Salt Lake area is in the midst of a plan to build 70 miles of light rail and commuter rail by 2015, a program made possible by a quarter-cent sales tax increase approved by voters in 2006. It’s a smaller overall program than the Measure R program approved by voters here — a program that is funding 12 transit projects, bus operations, highway improvements and is also returning 15 percent of its funds to local cities. I think the bigger story here is about the large western U.S. cities aggressively trying to catch up to their eastern counterparts when it comes to building transit. Portland and San Francisco got a head start and now Salt Lake City, Denver, Seattle and the Los Angeles area are catching up. It bodes well for the region, which will have exciting cities to match the West’s often spectacular settings. I cannot speak for Salt Lake City, for I haven’t yet been there. But don’t put Denver in the same category with Portland. A visitor to downtown Denver would never use the rail system. With only a stop at the railroad depot and a east/west stop on the 16th street mall, it is only for commuters coming into downtown. The Portland system has multiple lines stopping at over 15 stations downtown. It is by far the easiest way to get around downtown Portland. Couple that with the fact that Portland has, for the last 30 years, focused much of its development on downtown, and you have a very rail-dependent community. Chinese garden. Downtown. Art museum. Downtown. Washington Park (with the Japanese Garden and the Zoo) is only two rail stops past downtown. Central Library. Downtown. Powell’s books. Downtown. The only time we left downtown was to cross the river to go to OMSI, the science museum. And they are building a rail extension to that as we speak. Denver…well, I wound up walking to the botanical garden. No rail went there. I could have waited for a bus, but it only ran once an hour. Denver Zoo. Again, no rail. Even the Central Library was a hassle getting to. Portland has become a city where rail transit is indispensable to those living there. In Denver, rail is an occasional alternative to using the car when heading to downtown. One more thing…don’t think that because Denver’s system is newer that it will become more like Portland’s. It won’t. The Denver plan is to add more lines that converge onto the existing tracks that now lead to downtown. Downtown will get no additional stops. That is unlike the planning that took place in Portland: The recently opened Green Line did NOT run through downtown on the existing east/west tracks. It arrived with a new north/south route and thereby doubled the number of downtown stops for the rail system. Negative Negative Negative! Let’s look at some positives now! Salt Lake City is a growing city which needs and deserves light rail. Having lived there for almost twenty years of my life (now living in SoCal), it is a much needed addition to a city with increasing urban expansion and a rapidly growing population. I commend Metro for publishing this story and recognizing the efforts of other transit providers in other states for helping promote mass transit in their cities. Let’s work on making Los Angeles a transit-friendly city. Houston is another major metropolis that’s playing catch up as well. It’s a pretty rapidly-growing city (city proper is 2.1 million; metro area is nearly 6 million), but it currently has one light rail line running (the METRORail Red Line), and it’s only been around since New Year’s Day 2004. 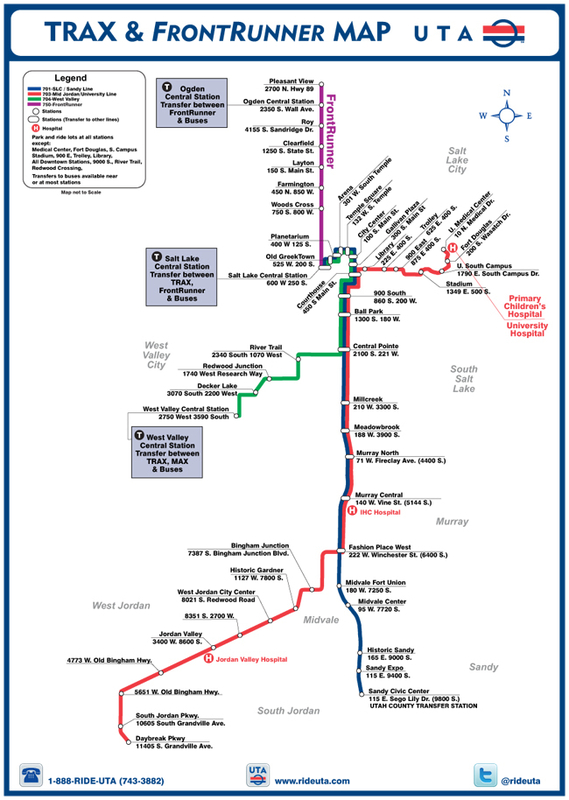 Their Red Line runs 7.5 miles, north to south, from the downtown campus of the University of Houston to the south end of the city, just outside of the Interstate 610 Loop. Before L.A. built its current rail transit system, Houston was the largest city in the nation without one. Right now, there is simultaneous work on building five more lines, all of which is scheduled to be completed by 2014, barring any legal hurdles. When it’s all said and done, the Houston Metro Rail system will look very similar to our own here in Los Angeles, a hub-and-spoke system with the majority of line originating downtown and heading in all different directions. That’s exactly what we don’t want in Los Angeles, as many activity and job centers are located outside downtown and need to be connected to without having to route through downtown. Downtown is fine as long as there are many other non downtown lines but metro has historically focused on connecting to downtown without regard to the west side for example. LA is a poly centric city and therefore needs a rapid transit grid rather than spoke. This can partly be made possible with the van nuys blvd./sepulveda pass line, the crenshaw line extending north to Hollywood/highland station, a 134 line, and hopefully a Santa Monica BLVD line through west hollywood. Do you actually hear yourself, Connor? It’s not enough that Los Angeles has hogged the bulk of the state of California’s and much of the nation’s transportation spending for its vast, totally needless, wasteful, sprawl-inducing freeway network, enabling motorists to continue their addiction to the detriment of all others, but now you want L.A. to have a mass transit GRID running willy-nilly over your precious “poly-centric” city? Give me a break! It’s not fair to keep taking and taking tax money from everyone else in the country so selfish Los Angelenos can live in single story detached houses in the suburbs! Every last one of you need to move your butts to a central core, say downtown, or to perhaps a small handful of other cores, say Santa Monica, Long Beach and Pasadena, and into mid- and high-rise residences and offices and put your light rail lines there, instead of demanding more freeways and more mass transit extended all over the map. The rest of us are tired of paying for your refusal to accept that low-density suburban sprawl, even mass transit-rich sprawl, is unsustainable. Yes I hear myself just fine thank you. You really need to calm down. I don’t support adding more freeways, or the priorities this city/county has made with transportation in the last 50 years, but how do you possibly expect that everyone is just going to instantly move and change their way of living the way you want them to. You want less transit use? More traffic? More pollution? You want to ignore half or more of the LA area? Yeah that’s a great Idea. Just tell everyone to move. Simple. That will work… No, we need to understand the reality that LA is a spread out place but while still improving the urban center and connections to it. Most of the sprawl was actually made possible by the interurbans, not cars, but they were stupidly ripped out and replaced with buses and then freeways because of the new found “car culture” which destroyed transit use and investment in it. Also Tokyo already has a transit grid, and yes, they are more dense, but what can you do? You cant just start seizing peoples houses all over the place then leveling the areas for new condos and apartments. You also assume that I don’t care about or support downtown or central core development/revitalization and the promotion of urban cores which I very much do but again, LA developed much of its sprawl before the age of highways so It makes sense to adapt the transit system if not to simply improve upon what it was becoming before being halted by car culture. LA is not Manhattan and it does not need to be, nor should it lack a strong urban core or cores either. It can be something in between spread out and Manhattan. You claim that LA drains tax money from the rest of the country assuming that no other city has detached homes. C’mon, really? And actually LA is more dense than most cities in this country with the exception of a few east coast cities, San Francisco and Chicago. Look, I say poly centric because it is, just look at the west side, its not precious to me, its just what it is. Selfish, really? refusal to accept? I guess its your way or the highway (no pun intended) and no such thing as balance. Learn to have an objective discussion about a very important topic, its obvious you are very militant about this unlike many other posters on this forum/comments system who agree with pretty much everything you say, they at least can discuss it with others in a rational manner. I have never seen anyone in my life react as negatively emotional as you do to a suggestion of how to lay out rapid transit. Good day to you. You’re absolutely right I’m upset. Los Angeles-style, car-dependent, freeway-tangled suburban sprawl has spread across the country, like a cancer, and its exponentially-costly road spending, mortgage subsidies and oil wars have reached their inevitable conclusion and brought the economy crashing down. Yes, there are other cities based on sprawl. There are many others that aren’t, however, and it is they that need to be emulated. The status quo does not have to be maintained. I don’t really think L.A. and cities have a choice, either. It’s not that we should tear down people’s single story homes. Foreclosure, blight, joblessness and gangs will take care of that. Sensibile people will move and I suggest they move to the core or one of a few cores. End the subsidies for sprawl and oil wars, as well. Something tells me, however, that anyone who can say, with a straight face, that L.A. is more dense than most cities in the country, will not be able to wrap their brain around the new reality taking shape across the country and planet. I don’t disagree that suburban sprawl is becoming less popular and I don’t really mind that either. I’m glad that there is a more urban attitude across the country, and even here that’s the case to some extent like with downtown LA development, but what i am saying is that adapting transit to the current built environment while making sure that the urban cores are connected to each other (ie. downtown, pasadena, santa monica, DT long beach etc.) is ideal. If you were to take all of Chicago’s transit lines for example (metra and CTA) and lay them out in a grid across LA I am sure you could have a fully functioning rapid transit system that could serve both suburban neighborhoods and urban centers. There are a lot of lines in Chicago. I use Chicago as an example because, even though it is hub and spoke, the rail lines all connect to just about every outer neighborhood, and yes, while they are suburbs the area has a great, vibrant city center, one of the best in the country and plus this conversation did start on the basis of hub and spoke vs grid not so much suburbs vs urban. LA deserves the same kind of connectivity, it just requires a different transit layout to accomplish it. And there is no reason that would be a detriment to urban centers. If anything it would boost them because it would encourage more people to spend time there. There is no reason why LA does not deserve this. If those options weren’t there in Chicago, all those people would just work in their suburbs or use the freeways and arterial streets to get downtown, making traffic worse and increasing the danger to pedestrians and further reduce air quality. Yet that’s what we experience in LA now, especially west LA. If we just leave any area out in the cold that is not in a dense core because of the uncertain future of suburban areas, leaving them out would only accelerate LA’s problems, not improve them. And you are right in that LA should go in the direction of the cities that are not based on sprawl, but, in doing that, you need to have a rapid transit system that serves more than just a small sliver of the existing metropolitan area. And yes, the oil wars are ludicrous, no question about it. Heck, our whole foreign policy is insane.